Discussion in 'Muppet Headlines' started by BoyRaisin2, May 19, 2005. GLENDALE, Calif. - Kermit the Frog dangles by his spindly legs in the hallway of a Walt Disney Co. office here, his red-felt mouth slightly ajar and his ping-pong ball eyes staring blankly at the floor. Like so many aging stars, the iconic Muppet has struggled in recent years to find a role for himself, only to be relegated to ancient re-runs and B-list movies. Now, Disney is making a bid to return Kermit to stardom. After a marathon courtship, Disney last year added Kermit and his co-stars from the 1970s television hit, ``The Muppet Show,'' to its coterie of characters for the seemingly modest sum of around $75 million. Done right, Disney thinks Kermit's troupe could become a classic like Mickey Mouse. ``I've always been convinced that there are three real characters that have enduring entertainment value, that are evergreens: Mickey, Winnie and Kermit,'' says Disney Chief Executive Michael Eisner, who has led the chase for the Muppets ever since the characters' creator, Jim Henson, was first looking for a television network to back his show. The big challenge: making the 50-year-old frog relevant to today's audiences. Disney's plan is to start by dusting off Kermit, Miss Piggy and other Muppets with a ``soft'' launch designed to appeal to a nostaglic adult audience. The first test comes tomorrow, with ``The Muppets' Wizard of Oz,'' a made-for-television movie, on Disney's ABC network, starring Kermit as a singing and dancing Scarecrow, Miss Piggy as the witches, the R&B singer Ashanti as Dorothy, and Pepe the Prawn in the role of her dog, Toto. Instead of the wide-eyed innocent in the 1939 movie, the new Dorothy wears Manolo Blahnik shoes, talks about Kabbalah and wants to be a pop star. In the runup to the movie, Disney has been priming Muppets fans in their 20s, 30s and 40s with cameo appearances meant to restore some of the original TV show's hip, irreverent lustre. In December, for instance, Kermit appeared alongside Robert De Niro on NBC's ``Saturday Night Live,'' and ABC has been running a series of ads for the coming ``Oz'' movie featuring the characters in scenes based on its hit shows ``Desperate Housewives'' and ``Lost.'' Miss Piggy, meanwhile, modeled a Prada dress in the British fashion magazine Pop. Kermit was featured at the wheel of the latest BMW, zipping across a desert, in German television commercials. In the works for summer: a line of retro-hip Muppets apparel, including green T-shirts with glitter-encrusted images of Kermit. And Disney will trot out various TV shows, such as ``America's Next Muppet,'' a reality-style contest in which new characters vie for a spot in the Muppets lineup. After the characters find their feet, Disney plans a ``hard'' launch, broadening the appeal to a wider audience including younger children, starting with a feature film in 2007. Then, if everything goes to plan, the floodgates will open to such things as stage plays, ring tones, theme-park attractions, TV specials and a possible relaunch of ``The Muppet Show'' itself. ``This is franchise that will ultimately appeal to most age groups,'' said Chris Curtin, general manager of Disney's Muppets Holding Co., who is leading the launch. The heart of Disney's strategy is to take the Muppets back to their roots in the TV show, in which Kermit sang classics such as ``It's Not Easy Being Green,'' and fended off Miss Piggy's advances. When Mr. Henson created the Muppets in the 1950s, he pitched them for adults, albeit with a child-friendly tone. After appearances on shows such as ``The Ed Sullivan Show,'' Kermit the Frog became a star on ``Sesame Street,'' which went on the air in 1969. After ``The Muppet Show'' started airing in 1976, Kermit made fewer ``Sesame Street'' appearances, although other Muppets, such as Bert and Ernie, remained as mainstays of the educational show. Since Mr. Henson's death in 1990, however, ``The Muppet Show'' characters have been increasingly directed at children - a strategic turn many people blame for their recent flops. Mr. Eisner has waited a long time for this moment. As an executive at ABC in his 20s in the late 1960s, he recalls, he was eager to put the Muppets on the network. But like many suitors, ABC wanted the Muppets to be a broader children's property. Mr. Henson was determined not to change the tone of the Muppets, and he went into business instead with the British TV mogul Lew Grade. ``The Muppet Show'' was syndicated around the world and launched Kermit as an international star. After five seasons, though, Mr. Henson decided to move on. He made some Muppet movies but then turned his attention to other projects. Still Mr. Eisner kept in contact with him and in 1990 struck a deal to buy the Muppets. On the day of signing, though, Mr. Henson died of a rare bacterial infection and Mr. Eisner's deal fell through. After that, the Muppets got caught up in years of corporate tag. Mr. Henson's children took control of the family business after their father's death but later sold the company to German media firm EM.TV & Merchandising for $680 million in stock and cash. EM.TV soon found itself in financial trouble and three years later sold back parts of the company for $78 million to the five Henson children, Brian, Lisa, Cheryl, Heather and John. 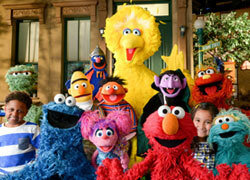 Ultimately, the children felt the characters belonged in a bigger media company that could leverage the brand. Disney was an obvious choice; while Mr. Eisner's deal fell through, Disney had worked on other Muppets ventures, including a theme park ride. ``We fully intend to work together going forward,'' says Brian Henson, co-chairman of the Jim Henson Co. Does this hold up? Is this plan realistic with Eisner stepping down? Time will tell it may be all disney's got. a possible relaunch of ``The Muppet Show'' itself. ``The Muppet Show'' characters have been increasingly directed at children - a strategic turn many people blame for their recent flops. This is the first I've read about Disney's actual intentions on how to use the Muppets. I'm glad to hear they have their feet firmly on the ground and are aware of what makes the Muppets special. Wow.......I got excited just reading this.........I hope it all comes true! At least they aren't turning the Muppets into another cold and corporate brand And the Muppets need more attention, too! I am not sure of the title of the last Disney/Pixar film but I think it might be Cars. I know it revolves around automobiles and I also know it will be the final joint Disney/Pixar production. The last Pixar/Disney film (Pixar is WAY more important so their title should go first) is indeed called "Cars" and scheduled for release in 2006. I have heard plans for a film entitled "Ratatouille". I do not know when this is to be released but unless another agreement is struck with Disney, it will not be through them. Pixar: Take my advice and head to COLUMBIA. Wow, now this is a massive whopper of a scoop article...this should be front page stuff. In my eyes, Disney has a massive hill to climb to prove to the fans...some of this stuff sounds ambitious so we'll see. "Despite the frantic schedule, Disney says it is taking things slowly. It estimates that by 2009 the Muppet brand will generate around $300 million in retail sales from consumer products including apparel, books and toys." I dunno, a part of me kind of likes the America's Next Muppet idea...I usuallty HATE the current culture of reality shows, but this sounds ripe for cool moments. Personally, after seeing Muppets of Oz.... I can't tell if this is a good or a bad thing. If they promise to make their projects as FAAAAAR from what Oz turned out to be as possible, I'm all for it. If they make more The Muppets in Prefab concepts starring some B-list celebrity in which the Muppets play second/third/or even fourth string characters, than I am not keeping my hopes up. The retro merchandise, I can live without, myself. Seeing as how the Muppet show characters are no longer being made into action figures (though, I'm still playing catch up with series 8 and 9... just 3 more to go, plus series 5 Gonzo) The merchandise will have to be REALLY darn good for me to care. A few t-shirts and stuff I'd get... maybe a plush of Pepe if they ever make one (besides the carny prize one). A TV show and a theatrically released movie, I wouldn't hold my hopes out for. Even if these do come out, whos to say they'll be any good? I mean, the last few muppet movies were pretty good, though hardly in a class with the first three. And I do look forward to a TV show, now that we have classic characters and Frank's characters (expertly played by Eric) back. But, seeing as how iffy (at best) the last 2 movies were, I'm having serious reservations. Hopefully, I'll feel better after Michael Eisner leaves. Again, like most other people, Im not getting my hopes up. Disney has screwed up a lot in the last 15 years. Eisner stepping down might be a good thing, though we know he did like the Muppets and not sure if the new CEO does or to the same degree. A new Muppet movie for 2007 (presumably fall release) would have to be in the works already, meaning a script is near completion and the director (Thatcher again? Brian Henson-doubtful?) would be looking at casting and design for the film already. It seems like a poor attempt to get some fans on the side of Disney as they plan to switch CEO's. and how are they going to get a show on the air by 2009? if Disney releases a film in late 2007, they have one year to deliver a show. Sure, Sesame Street does it, but they have a formula and know their audience. Disney hides behind the protective curtain of saying that the Muppets appeal to everyone. well, you know what? pick a demographic and at least let us know how you plan to approach it. others had mentioned, and I agree, that Jim Henson made the muppets for the child in every adult and the adult in every child. This is somethign very foreign from Disney's current success formula. They havent had a hit since Jeffery Katezenberg left to start Dreamworks with Geffen and Speilberg. DISNEY: GIVE THE MUPPETS BACK TO PEOPLE WHO KNOW HOW TO USE THEIR TALENTS! -- THE FANS! if they'd check out some of these boards, a good 30mins of reading, they'd have free market response and advertising taken care of for them. bottom line: I dont think Disney will achieve what it expects...talking about the muppets in terms of dollars and cents is ridiculous to beign with at this point. Breakfast with Bear is a good idea. Why not Breakfast with the Muppets? This sounds awesome, when would they know if they were going to do this? Truly splendid. So it does. But note the other part of the line: "by 2009". That's four years away. A lot can happen in four years. In fact, a lot WILL happen- in four years, I'll be in college! Ooh, scary thought. Anyway, my point is that we don't really know if everything will go according to plan, or if the plan might change, or if "books" got thrown in by mistake. Anything could happen. Let's hope the right things happen. IF the right things happen, we will all be extremly happy. This is something I am really looking forward to. Very interesting article, I hope their goals become a reality. It's unbelievable. this is so simple and the Henson kids just don't get it. They should find another company in England similar to Lew Lord Grade, and just re-do the Muppet Show just the way it was done back in the Late 70's The exact same characters, same type songs, re-do the same songs, and everybody will be happy. I guarantee if it went back to that format, veterans like Frank Oz, and Jerry Juhl will want to be involved full force despite their current schedules. They have to look up every element, every detail of what was once used, and basically just do the same exact thing again. Nothing else works. Bottom line. Bring back as many of the original people as possible along with fresh new talent and lets see what happens. You can't go wrong! A return to 70's variety tv show? ugh, I'd rather return to Jim Henson Hour format. Tho, anything must be better than a forray into the dreaded reality tv show world. Incidentally, in 2002 JHC was planning to launch a new Muppet show on Fox prime time, rumored to take place in a theatre similair to the old set. this sounds great but is it all opossible and im slightly worried that disney will make it so different Im mean by the end some of the carater could sound really different. Here's something interesting to discuss! What's everyone's thoughts on new muppet characters joining the cast, and how do you think disney would influence it? For better.... or worse...? 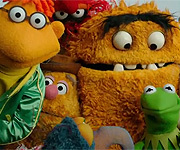 I'd like to see more female characters in the Kermit Piggy Fozzie Gonzo Animal bunch. But even if there's just more male characters, that's ok too... as long as they have enthusiastic performers and good writing behind them.